The chapter provided the vast majority of the construction manpower needed for camp assisting people with special needs the weekend of April 5-7 in a nearby state. Omega sent 14 of the 26 members of Pi Kappa Phi members to Camp Big Sky in Fairview, Illinois. The other chapters represented were from Western Illinois and DePaul. The project was coordinated by the Ability Experience (abilityexperience.org), the national fraternity’s national outreach program. 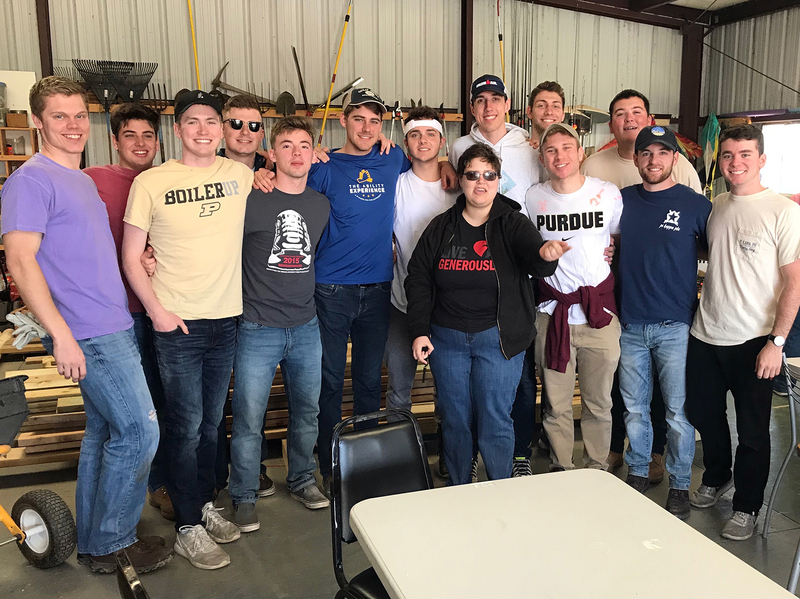 The group completed a wheelchair accessible ramp that was begun by Build America, the national fraternity’s summer service project throughout the United States. The fraternity volunteers also stained the house at the campsite, replaced insulation in one of the cabins and replaced wooden planks on a dock. Furthermore, on behalf of The Ability Experience, the men presented an unrestricted $5,000 gift to further the needs of the facility. Camp Big Sky (campbigsky.org), which is about 160 miles from the Purdue campus, provides education, training and skill development for children and adults with various disabilities through various outdoor activities, according to its website. The Purdue chapter sent the following members: Justus Schumann, Campbell Boston, Seth Cantrell, Jack Kellison, Michael Bailey, Andrew Beering, Ryan Patout, Tom Hirshfeld, Nate Longo, Jack Cleary, Luke Oldford, Drew Thieme, Marcus Perkins and Jacob Moeller.